Swashbuckling batsman Chris Gayle smashed a blistering half-century before Yuzvendra Chahal returned with a three-wicket haul as Royal Challengers Bangalore defeated Gujarat Lions by 21 runs in their IPL encounter here today. 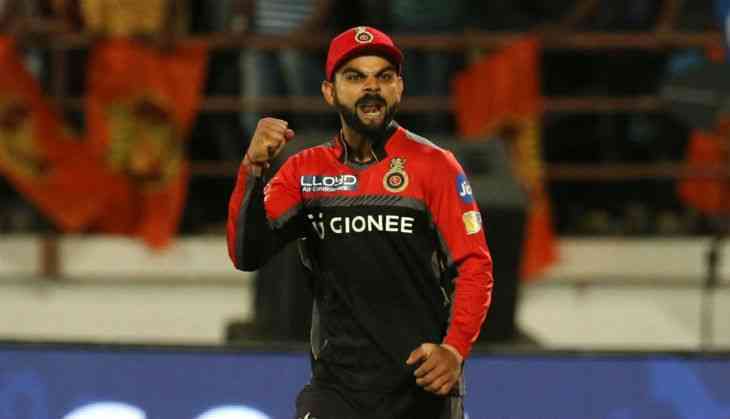 Gayle slammed a 38-ball 77-run innings, while skipper Virat Kohli produced a superb 50-ball 64 to guide RCB to a massive 213-2 after Gujarat skipper Suresh Raina won the toss and elected to field. Gujarat's opener Brendon McCullum then played a superb 72-run off 44-ball innings, studded with two fours and seven sixes but he didn't get the support from the other end as RCB restricted the Lions to 192-7 to snap their three-game losing streak. Yuzvendra Chahal (3/31) was the pick of the bowlers for RCB as he picked up three crucial wickets -- Dwayne Smith (1), Suresh Raina (23) and McCullum -- in his four overs to derail Gujarat's runchase. Chasing 214 to win, Gujarat lost their opening batsman Smith early when he was caught at the boundary line by Mandeep Singh off Chahal's bowling at deep square-leg. Skipper Raina then slammed a quick-fire 8-ball 23 which included two fours and two sixes before becoming the second wicket of Chahal. Coming down the pitch, Raina tried to play a sweep shot which went straight to Shane Watson at short fine leg. McCullum (72) and Aaron Finch (19) then stitched a 66-run innings off 34 balls for the third wicket to take Gujarat across the 100-mark in 10th over. McCullum also added 31 off 22 balls with Ravindra Jadeja (23) before becoming the third victim of Chahal in the 15th over as Lions looked down the barrel. Jadeja then was run-out after a mix-up with new batsman Ishan Kishan in the 18th over. Kishan then hit a 16-ball 39, laced with four sixes and two four but it was too late in the end. Earlier, Gayle and Kohli gave Bangalore a brilliant start as they amassed 45 in the first six overs and then went on to forge a 122-run opening partnership off 76 balls. Gayle's innings was studded with five boundaries and seven massive sixes, while Kohli blasted seven fours and one six in his 50-ball innings. Kohli took the early initiative as he picked up a boundary each in the first two overs before blasting Dhawal Kulkarni for three fours in the third over. Gayle, who has been out of form, meanwhile, completed his 10,000 runs in twenty20 cricket with a single off Basil Thampi in the fourth over. The West Indies batsman then blasted his first six of the innings over mid-off. He then sent young mystery spinner Shivil Kaushik for another maximum over long-off in the seventh over. Gayle then exploded with successive fours and a six off left-arm spinner Ravindra Jadeja. He also blasted the last delivery of the over for a maximum but he was brilliantly caught by Brendon McCullum at the long-off boundary. However, Gayle survived after replays showed that McCullum's hat had touched the boundary line. Gayle made Lions pay as he brought up his fifty with a massive six over long on off Kaushik in the 10th over and then clobbered Smith for another six as RCB reached the 100-mark. The dashing opener sent Smith out of the park again in the fourth ball over long-on as RCB picked 17 runs off the over. In the 13th over, Thampi finally dismissed Gayle when he trapped him leg before to break the partnership. Kohli, however, continued to score runs and reached his 28th IPL fifty in the 15th over with a couple of runs off Kaushik. He then blasted a towering six over wide of long-on in the 4th ball. Newman Travis Head (30) then sent the last ball for another maximum over deep midwicket. In the next over, Kulkarni returned to dismiss Kohli, who holed out to deep midwicket with Smith taking the catch at the boundary line. Head and Kedar Jadhav (38) then provided the late charge to take RCB across the 200-mark. While Jadhav cracked five fours and two sixes, Head hit two fours and a six in his innings. For Gujarat, Thampi (1/31) and Kulkarni (1/37) took one wicket each. Video: Vidyut Jammwal workout session with his dog!